Born on 9 September, 1952 in Bor, a little town on east of Serbia. Bachelor degree in geography obtained at University of Belgrade. He began painting during childhood. However, since 1985 his search of his own art identity has started.. A student of Professor Jaroslav Kandic's private art class. He lives and works in Becej, Serbia. Materials on Bane's Still Lives are almost tangible. A lasting attempt to paint transparency - of glass, interlaces, structure and unequal shades of lumber is great challenge that the painter copes with easily. Plastic of forms is highly expressed, partially due to the artist's interest in light, shading and illumination. CRITIQUES: "... Puletic has successfully and without concrete school overcome all secrets of the profession , he shows that sovereignily rules with brush, color and materials, and on some of the paintings reaches those heights that even more famious painters could't reach... " Mirko Maksimovic - Maks, Beograd 1994. "... Puletic rules with exemplary realistic technique and he's using that technique to create his pastel still life." Sreto Bosnjak, historian of art, Belgrade, 1995. "... Skilled and arranged objects, closed, almost sculptural forms have characteristic of realistic mode in which he discovers the best way to artistically express himself." 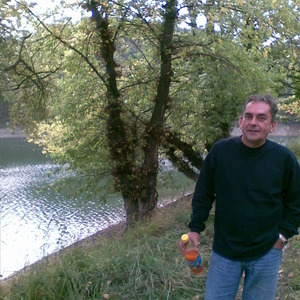 Zdravko Vucinic, historian of art, 1996. "... Puletic extremely skilled, technical precisely and arranged presents still lives with usefully objects from daily life. With skilled combination of light and shadow we get accent volume of the objects. " Jelena DJordjevic, historian of art 1997. "... It's almost tangible material on still lives of Branislav Puletic. A grate challenge is attempt to paint transparency - of glass, interlaces, structure and unequal shades of lumber and with that the painter very successful handle It. A plastic of forms comes more in the first plan, in opposite with dark undefinite background, which Puletic choose for the frame of his ideas. " Maja Stankovic, historian of art, 1998. "...It's always a pleasant surprise, when you meet an artist of precise drawing and colourful treatment, with expectation that his full creative volume will be on higher level in the future. " Dusan Boskovic, art critic, August 25, 2004.